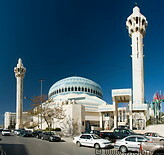 The King Abdullah I mosque was built between 1982 and 1989 in Amman by King Hussein I and named after his grandfather, the first Emir of Transjordan. 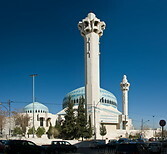 The mosque lies on the Jebel al-Weibdeh hill in western Amman and is capped by a magnificent blue mosaic dome. It can accomodate 3000 people.